Will lemurs survive parasites gone wild? DUKE (US) — Rising temperatures and shifting rainfall patterns in Madagascar could fuel the spread of lemur parasites and the diseases they carry. By combining data on six parasite species from ongoing surveys of lemur health with weather data and other environmental information for Madagascar as a whole, a team of Duke University researchers has created probability maps of likely parasite distributions throughout the island today. Then, using climate projections for the year 2080, they estimate what parasite distributions might look like in the future. “We can use these models to figure out where the risk of lemur-human disease transmission might be highest, and use that to better protect the future of lemur and human health,” says lead author Meredith Barrett, who conducted the study while working as a graduate student at Duke. Lemurs are native to the African island of Madagascar, where climate change isn’t the only threat to their survival. More than 90 percent of the lemurs’ forest habitat has already been cleared for logging, farming and grazing. Illegal hunting for bushmeat is also a problem. A key part of saving these animals is ensuring that they stay healthy as environmental conditions in their island home continue to shift, Barrett says. Average annual temperatures in Madagascar are predicted to rise by 1.1 to 2.6 degrees Celsius by 2080. Rainfall, drought, and cyclone patterns are changing too. In a study published in the January 2013 issue of the journal Biological Conservation, Barrett and colleagues examined what these changes could mean for lemur health by taking a cue from the parasites they carry. 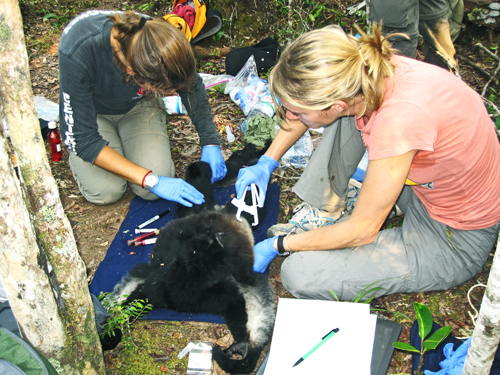 The team focused on six species of mites, ticks, and intestinal worms commonly known to infect lemurs. The parasites are identified in lemur fur and feces. Some species—such as pinworms, whipworms, and tapeworms—cause diarrhea, dehydration, and weight loss in human hosts. Others, particularly mites and ticks, can transmit diseases such as plague, typhus, or scabies. When the researchers compared their present-day maps with parasite distributions predicted for the future, they found that lemur parasites could expand their range by as much as 60 percent. Whipworms, for example, which are now largely confined to Madagascar’s northeast and western coasts, may become widely distributed on the country’s southeastern coast as well. Anne Yoder, senior author on the study and director of the Duke Lemur Center, says the research is particularly important now as lemurs have been identified by the International Union for the Conservation of Nature as the most endangered mammals on earth. Warmer weather means that parasites could grow and reproduce more quickly, or spread to higher latitudes and elevations where once they were unable to survive. As lemur parasites become more prevalent, the diseases they carry could show up in new places. The spread could be harmful to lemur populations that have never encountered these pests before, and lack resistance to the diseases they carry. Shifting parasite distributions could have ripple effects on people too. As human population growth in Madagascar drives people and their livestock into previously uninhabited areas, wildlife-human disease transmission becomes increasingly likely. The authors hope their results will help researchers predict where disease hotspots are likely to occur, and prepare for them before they hit. Meredith Barrett is now a postdoctoral scholar with the Robert Wood Johnson Foundation Health & Society Scholars Program at the University of California at San Francisco and Berkeley. Jason Brown of Duke University and Randall Junge of the Columbus Zoo and Aquarium were also authors of this study. The National Science Foundation, the Saint Louis Zoo Field Conservation for Research Fund, Duke University Center for International Studies, Duke University Graduate School, Nicholas School of the Environment, and the Robert Wood Johnson Foundation funded the study.